You can make mosaic street numbers and signs using a grid, but mosaics made from irregular shapes of non-gridded tesserae are more interesting, especially if you use concentric andamento for the background surrounding the figures. 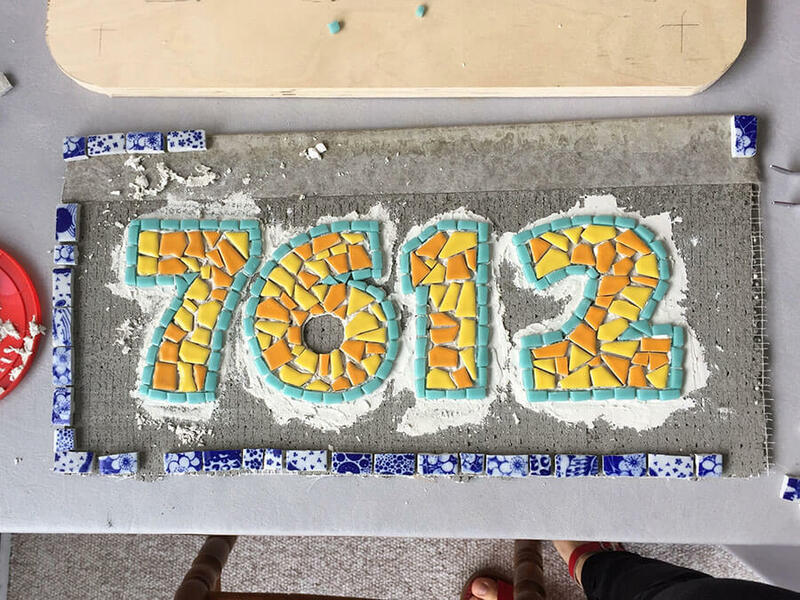 Sara Sommers emailed us some pictures of her mosaic street number plaque, and it is made from cut pieces of tile in strongly contrasting colors. 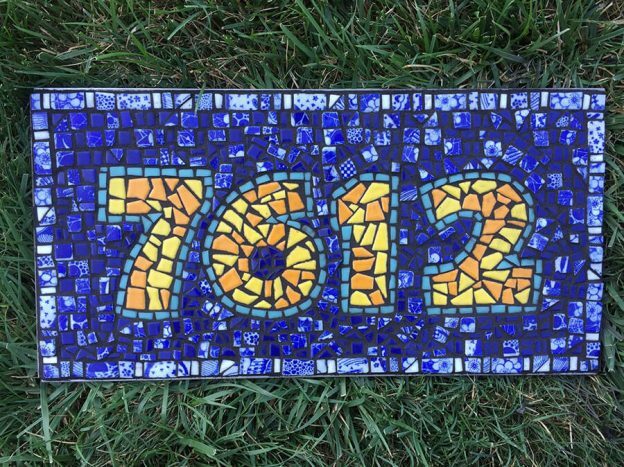 It is definitely worth checking out if you are thinking of making a piece with large mosaic letters or numerals. For starters, Sara uses strong color contrast between her numerals and background, which is critical for making eye-catching art. She also uses multiple related colors and variegated patterns instead of solid monochromatic color fields. 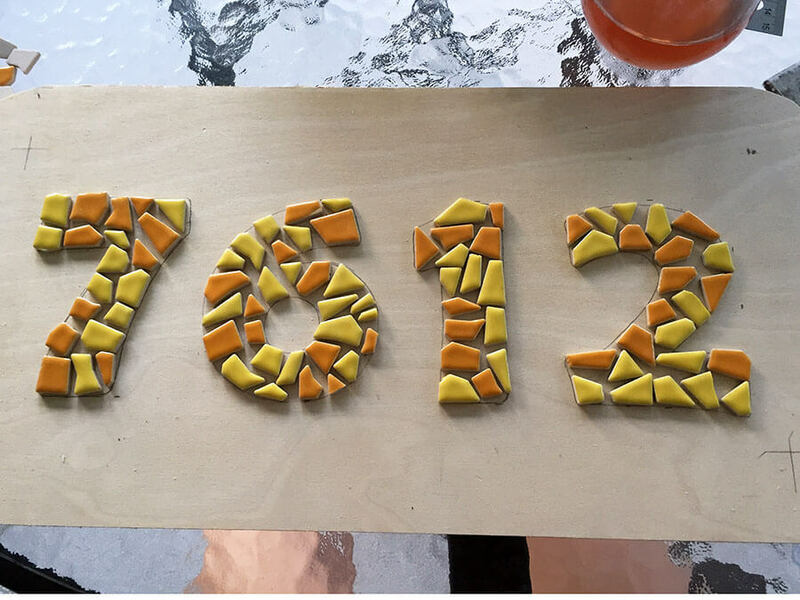 The numerals are made from yellow and orange colors of our Irregular Glazed Ceramic Tile, and the background is made from our china-patterned Glazed Porcelain Tile mixed with some of our Morjo™ 12mm Recycled Glass Tile in dark midnight blue. For added visual interest, the numerals are outlined in cut pieces of Morjo™ in a lighter blue color. Sara started by drawing some outlines of the numerals she wanted to mosaic. 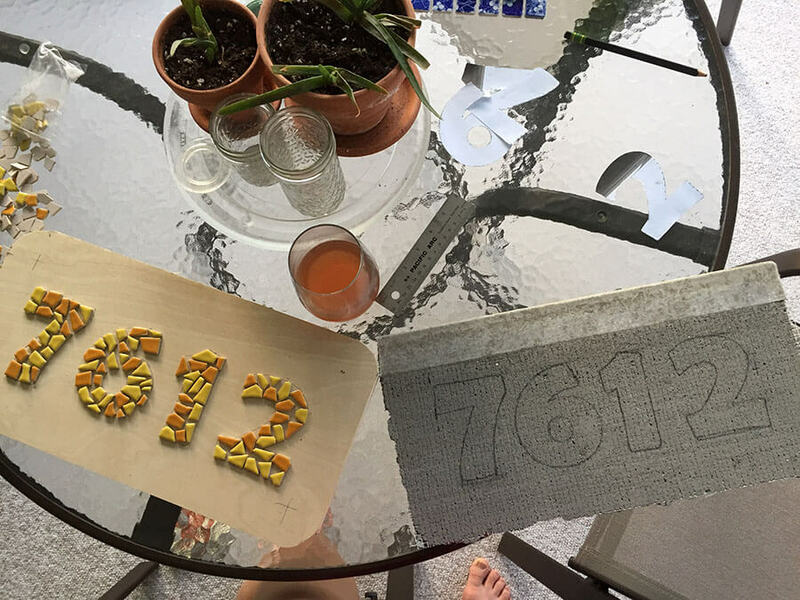 You could use stencils for this purpose or even the numerals and letters sold in craft stores as improvised stencils and then return them. In the picture above, notice the extra-large spaces between some of the tiles in the numeral “2” and compare that to the revised numeral “2” in the picture below. While grouting can “pull things together” and help make separate pieces of tile represent a solid figure, it can’t help inconsistent spacing of tile. In fact, grouting usually makes inconsistent spacing look worse. If you have larger gaps in places, those will stick out like a sore thumb when they are filled with concrete, especially if they are in a focal point, such as a face or the eyes of a face. Since this mosaic was going to be mounted outside, it was critical that it be made on a backer that wasn’t vulnerable to moisture and humidity, instead of plywood, which eventually warps and deteriorates outside. Also, thinset mortar is used instead of mosaic adhesive to mount the tiles. 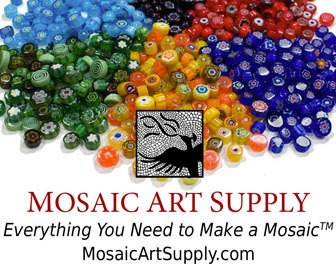 This entry was posted in Art Review, Improving Your Art, Inspiration and tagged backer board, color scheme, contemporary mosaic, design considerations, garden mosaic, outdoor mosaic on July 13, 2018 by Joe Moorman. Thanks for this article, Joe. It confirms what I’ve been doing on a hunch. I use tile concrete backer board for mine, thin set mortar, and all glass tiles. I cut my board using a jig saw, and then I can get unconventional shapes. I’ve found that I only need the 1/4” backer board, which can be scored and broken into squares and rectangles. I’m still trying to work out the logistics of building an obelisk using backer board and treated lumber. This is a lovely design! That is a good point about the 1/4-inch concrete backer board. It is easier to cut than the 1/2-inch board, and you can always cut out two copies and then laminate them together with thinset mortar if you needed something thicker. Your newsletters are soooo informative, Somehow I ended up on your email list and very happy that I did. Keep them coming. Thanks!